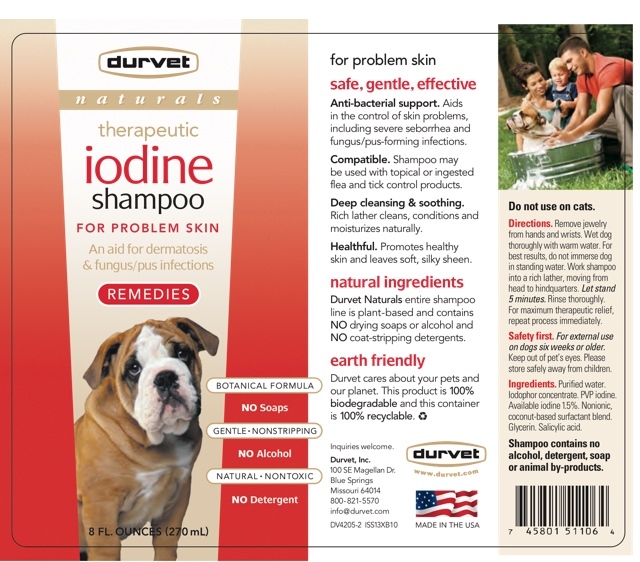 Naturals Iodine Shampoo - Dinovite, Inc.
Anti-bacterial support: Aids in the control of skin problems, including severe seborrhea, yeast and fungus/pus-forming infections. Compatible: Shampoo may be used with topical or ingested flea and tick control products. Natural Ingredients: Durvet Naturals Iodine Shampoo is plant-based and contains NO drying soaps or alcohol and NO coat-stripping detergents. Earth Friendly: This product is 100% biodegradable and this container is 100% recyclable. Remove jewelry from hands and wrists. Wet dog thoroughly with warm water. For best results, do not immerse dog in standing water. Work shampoo into a rich lather, moving from head to hindquarters, being sure to keep out of pet's eyes. Let stand 5 minutes. Rinse thoroughly. For maximum therapeutic relief, repeat process immediately. For external use on dogs six weeks or older. Keep out of pet's eyes. Store safely away from children. Purified water, Iodophor concentrate, PVP iodine, Available iodine 1.5%, Nonionic cocount-based surfactant blend, Glycerin, Salicylic acid. Shampoo contains no alcohol, detergent, soap or animal by-products. Our male dog smelled all of the time, even after a bath. He smells so much better after this shampoo. I have been using this shampoo on my little dog for over 2 months now, and every time I bathe her, her fur is nice, smooth, smells good, and any itching seems to go away. I like it a lot better than the prescription shampoo I got from my vet, that cost $2500!! My dog has more energy , nice coat and clear eyes since I have been giving her Dynovite and LicO Chops!! This product has improved my dogs fur condition immensely!! !